For many of us who are dismayed and disheartened about the state of the classical arts, yesterday's music concert by Carnatic Vocalist Sudha Raghuraman and Hindustani Vocalist Meeta Pandit was a lovely collaboration. I had often wondered why this isn't done more often, and was even thinking of trying to use both styles in a piece I'm working on - and here it was! I have heard from young singers of both fields about the various prejudices that exist about one another. In that light especially, it was wonderful to see the two singers respectfully singing together, allowing each other space to express, in tune with each other. 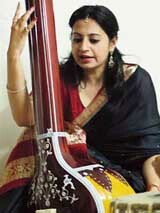 Sudha Raghuraman, who I dance alongside sometimes, was just stunning. The intensity with which she sang was punctuated with bits where she was connecting with the audience, herself smiling, almost saying - 'Did you notice that?' 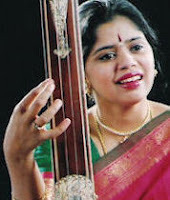 Meeta Pandit and Sudha Raghuraman melded together as they sang the two different styles in unison in a song dedicated to Jayadeva. Rather than clashing, they really did illustrate that the walls that we create between different styles and art forms, are futile and counter-productive. I loved the way the two voices, the tabla and mridangam, and the sarangi and flute held their ground on the same stage with such ease, beauty and complimentarity. This performance was part of the Delhi International Arts Festival, and I hope we see more of such collaborations in the future!